How to establish and grow a successful Peony in colder regions of Victoria. In the middle of May 2019, cut all the stems and leaves off your Red Hill Peony Estate Peony (leave a couple of cms of stem so you know where your crown is, (throw leaves in the bin not compost as the fungus, Botrytis may be a friend to our wine industry but is certainly not a friend to our Peonies). Plant your potted peony into the ground (or pot) in the middle of May 2019. 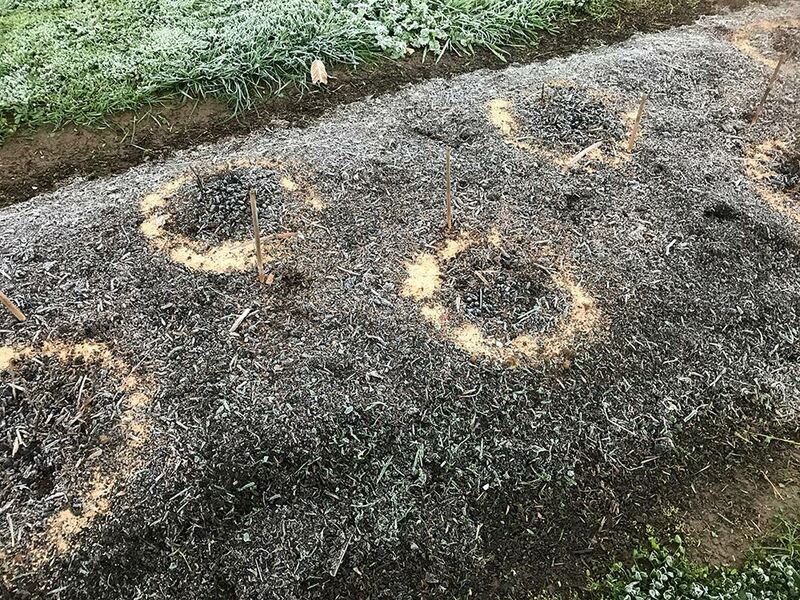 ***Make sure that the top of your plant is sitting no more than an inch under the ground, (it must be close to the surface to get the frost and/or the ice that you are going to put on your plant). 3-4 times during June and July, on a cold night so it does not melt too fast; put a good cup of ice on top of your peony to help the flower buds develop: (although do not let your Peony plant actually flower until it has had two full years in the ground). Never put leaves or compost on top of your peony unless temporarily protecting it from a very late frost. In Autumn and Spring each year, add a handful of Dolomite and a fist full of “Rooster Booster” (only available from Bunnings), to your Peony. I also suggest that for more information and illustrations on all things “Peony”; visit the site of a large North American peony farm www.peonyenvy.com for detailed knowledge so generously shared by owner, Katherine Gagan. waterlogged, and are not watered by a daily sprinkler system. They are tolerant of a wide range of pH but prefer neutral to slightly alkaline soils, a pH to 6.5 – 7.5. If you are unsure of your soil condition or pH, you can purchase a pH Test kit from a garden centre (e.g. Bunnings). When choosing a site first, consider the amount of sun. As a minimum, they need 5-6 hours of sun a day. The more sun an herbaceous peony has, the better it will grow and the more flowers it will have. Planted in less than full sun, it will take longer to mature and flower. I have found that the Australian hot 40+ degree days do burn their leaves, you could always shade them for those hot days. Peonies planted in sandy soil take less time to become established but can produce less striking plants as nutrients easily leech out of the soil. If planting in sandy soil, amend with clay and compost and top dress several times a year with compost to renew the soil. Be cautious when top dressing as this can increase the depth of your plants and plants that are too deep will not flower. As your peony prefers to be planted and left in one location for generations, it is worth taking the time to dig a proper hole and amend the soil. Once you have dug a hole you will need to create a friable loam – a soft, dark, rich, loose, soil that is composed of clay, compost (try and source a compost with no or few sticks, as sticks can introduce fungus to the roots), and sand. These soil conditions will allow for free water flow while retaining proper moisture and nutrition. If you have clay soils you will need to amend for drainage. A good solution is to mix compost and rock dust, (Lilydale topping type fine grit or even some chicken shell grit), crushed stone often used as a base when laying out new paving stones, into your soil. Rock dust can be obtained from a neighbourhood quarry (Hillside in Dromana). Gypsum, a type of rock dust, can be obtained commercially from garden or hardware centres or from Diggers in Dromana. In addition to drainage, rock dust has the benefit of adding micro-nutrients to the soil. If you have sandy soil amend with clay and compost to increase the retention of nutrients. This consists of three parts compost, two parts stone dust, and one part dirt from the hole. For the top of the hole, surrounding the peony root itself, we create a mixture of equal parts compost, stone dust, and dirt from the hole. Peonies are long-term perennials that will live for generations. They do best when planted in the ground. That said, you can plant peonies in pots if you don't have any ground space and you are experienced growing perennials in pots. Containers should be over 5 gallons in size, the bigger the pot the better. Tree peony pots need to accommodate a deep planting, with extra room at the bottom for drainage. Commercial potting mixes are available, look for those with extra porosity. In mixing your own consider using rice hulls, crushed granite (at feed stores, used for raising chickens), or crushed rock (available at stone centres) to increase drainage. Remember that your peony may need to be staked and that it will take several years to reach full size. Containers will need to remain outside in the winter as peonies need the cold season to flower. Be sure that your pots do not fill with water as this will cause peonies to rot; (cover during constant wet periods). I do not recommend having peonies in pots for a few seasons and then moving them to the ground. Peonies should be planted originally in their permanent location. Moving them will cause undue stress to the plant. The exception is that if you are moving, take your peonies with you. The ideal time to dig peonies is in the autumn. It is acceptable to dig your peonies in autumn, put them in pots, and replant them in their new location the following autumn. All the best everybody, we are all still learning how to best grow them, so feel free to share your stories.